Spring is full of pastel colors like these pretty bags. 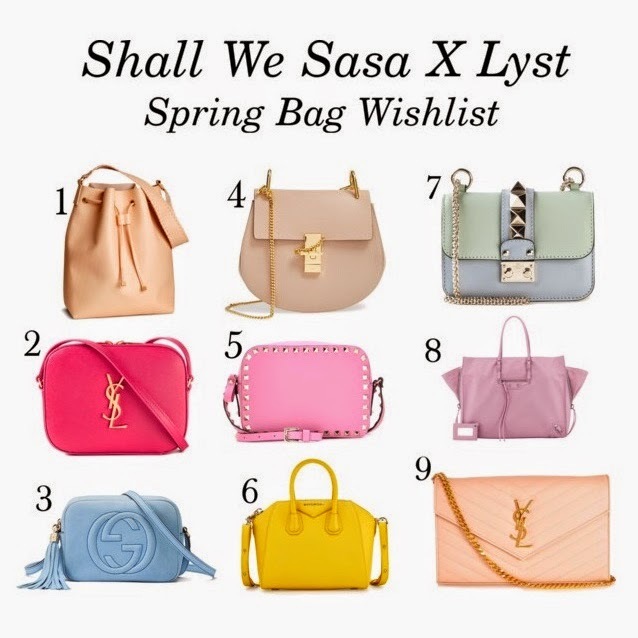 I made a wish list for spring bags on Lyst for those of you who are currently looking for one :P Most of the bags are classic and timeless like the Valentino, Saint Laurent, Gucci and Givenchy ones. These pretty colors also give the classic a new twist and something special. While I was creating my wish list, I discovered so much more about Lyst and I want to share my experience with you girls. -When I first registered my account, it asked me the brands I like and I don't like. The more searching I did there, the more items I found I'm in love with. It really feels as if Lyst is a smart friend bringing the latest of all my favorite brands right to me. He knows what I like and what I don't like. -I also got notifications when the items I lysted went on sale or came back in stock somewhere. After all it's really difficult to keep track of all these things because I'm normally "eyeing" a number of things at the same time. It's so awesome to find my favorites items when they go on sale. -Lyst partners with over 12,000 brands to bring the world of fashion to me. Brands like Givenchy, Gucci, Valentino, Balmain, Balenciaga and Saint Laurent are all available on Lyst. - Lyst is a great online space for me to stay inspired. On the opening page, there are lots of articles shared by Lyst editors and brands, which provide me another source to keep up to date with what is new and fresh. - There is also something called "The LongLyst" on the site. The LongLyst includes interviews with the fashion elite and those in the know as well as explores the history of the world's most popular garments and trends. #4 and #7 is definitely on my wish list!! AMAZING BAGS, I LOVE IT!! All these bags are so beautiful and the colors too! I love these picks! And I've never tried Lyst I will have to check it out! ohh i love these pastel colors! Love then almost all.Great list! LOVE all of these! Totally swooning over all of the shades of pink. All the options are amazing. Thanks for sharing and check out my blog for a chance to WIN sunglasses.